The United States Congress designated the White Mountains Wilderness (map) in 2009 and it now has a total of 229,953 acres. All of this wilderness is located in California and is managed by the Bureau of Land Management and the Forest Service. With elevations reaching 11,580 feet, up to six feet of snow blankets these mountains from the middle to latter part of November until as late as June, hence the name White Mountains. The White Mountains run generally north-south, with the Mescalero Apache Reservation anchoring the southern end, just outside the Wilderness. The steep west side is extremely rugged, with extensive rocky outcroppings, while the gentler east side is distinguished by broad forested canyons and a few tiny streams. The Wilderness includes many ridges branching off the main crest. Meadows and grassy oak savannas break the continuity of the forest, especially along the crest. Abrupt elevation changes with accompanying variations in vegetation, tall escarpments, avalanche chutes, and bold rock promontories combine to create dramatic but scenic contrasts. Several of the streams flow year-round and may hold a few small trout. You'll see terrestrial wildlife in abundance: mule deer, elk, black bears, wild turkeys, porcupines, badgers, bobcats, foxes, coyotes, skunks, squirrels, and many species of mice, voles, and rats. Although many types of birds live in the White Mountains, it's a critical habitat for five specific species: northern three-toed woodpeckers, Clark's nutcrackers, red-breasted nuthatches, Townsend's solitaires, and golden-crowned kinglets. About 50 miles of easy-to-strenuous trails trace the ridges and canyon bottoms. 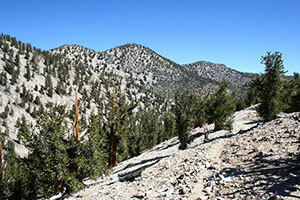 Almost all the paths eventually join the 21-mile-long Crest Trail, which offers views worth the lengthy hike. Water, though not plentiful, can almost always be located with a bit of looking. Planning to Visit the White Mountains Wilderness? How to follow the seven standard Leave No Trace principles differs in different parts of the country (desert vs. Rocky Mountains). Click on any of the principles listed below to learn more about how they apply in the White Mountains Wilderness.